On Monday February 11th, sharia-adherent Congresswoman Ilhan Omar publicly acknowledged her anti-Semitic comments, but stood by her criticisms of Israel. The Koran, which according to Islam contains the uncreated words of Islam’s god Allah, reveals a systemic hatred for Jews. 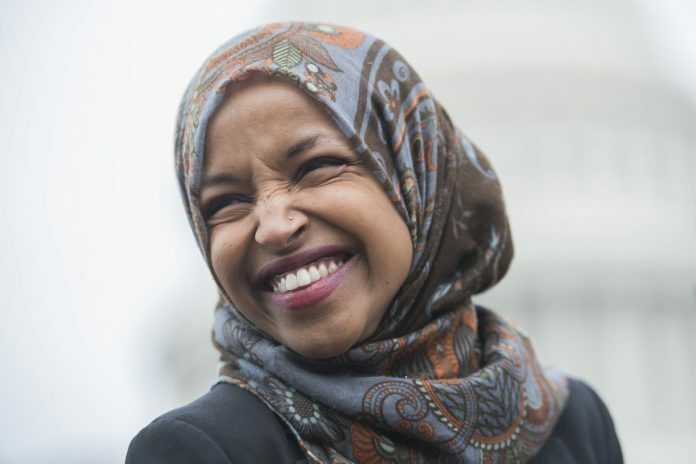 The Koran commands muslims not to take Jews and Christians as friends, and muslims who do will go to hell (Koran 5:51). In the Koran, Allah turns the Jews into apes and pigs (Koran 2:63-66; 5:59-60; 7:166). 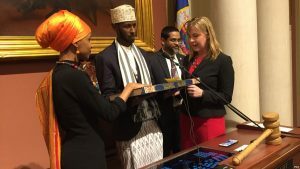 U.S. Representative Ilhan Omar (MN Democrat) who took over Keith Ellison’s House seat, swore her Oath of Office on the Koran. 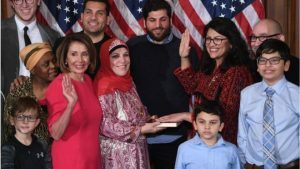 U.S. Representative Rashida Tlaib (MI Democrat) swore her Oath of Office on the Koran. A 2015 survey from the Institute for the Study of Global Antisemitism and Policy came to the same conclusion. 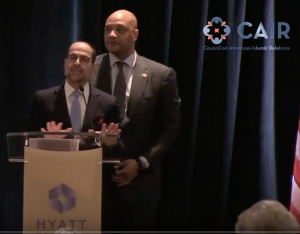 On January 10, 2019, the three (3) muslim Members of Congress – Ilhan Omar, Rashida Tlaib, and Andre Carson – all attended and participated in festivities hosted by the terrorist group Hamas doing business as the Council on American Islamic Relations (CAIR) at the Hyatt Crystal City in Arlington, Virginia. 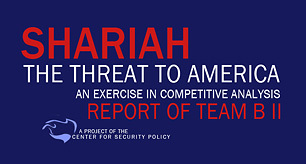 See the full video produced by Hamas (CAIR) here. 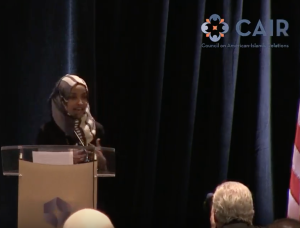 U.S. Congresswoman Ilhan Omar (MN Democrat) speaks at Hamas event held January 10, 2019 at the Hyatt Crystal City in Arlington, Virginia. 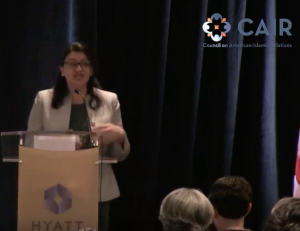 U.S. Congresswoman Rashida Tlaib (MI Democrat) speaks at Hamas event held January 10, 2019 at the Hyatt Crystal City in Arlington, Virginia. U.S. 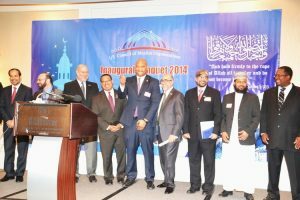 Congressman Andre Carson (IN Democrat), seen standing with U.S. Hamas Leader Nihad Awad, speaks at Hamas event held January 10, 2019 at the Hyatt Crystal City in Arlington, Virginia. See CAIR is Hamas at UTT’s website for some of the evidence detailing CAIR’s creation by the U.S. Muslim Brotherhood’s Palestine Committee which is Hamas in the United States. (L to R) U.S. Hamas Leader Nihad Awad, USCMO Board Member Mazen Mokhtar, USCMO Board Member Khalil Meek, U.S. Congressman Keith Ellison (now MN AG), U.S. Congressman Andre Carson, USCMO Secretary General Oussama Jammal, ICNA President Naim Baig, USCMO Board Member Delwar Hossain, USCMO Treasurer Warith Deen Mohammad Jr.
Today in Congress we have three (3) muslim Members of Congress who: overtly support the Koran over the Constitution, are working with the U.S. Muslim Brotherhood’s leaders to undermine liberty and America’s Constitutional Republic, and are violating their Oaths of Office by failing to “protect and defend” the Constitution while participating in actions that can only be described as seditious. 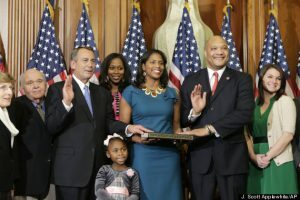 In an America with a functioning counterintelligence apparatus and Department of Justice, these three Members of Congress would be facing federal charges. But the establishment Republicans, as well as Democrat leaders are giving them a pass. This is a good reminder for readers waiting for Congress to “do the right thing” – this war will be won locally in your county and city. 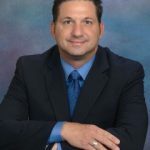 Get it done there because the federal leadership appears unwilling to do their duty and their jobs.